Every day when I give the horses their once daily pellets, soaked with herbal powders and other supplements, we do a permission check. This is so important, especially with a food-aggressive horse that pins his ears and wants to hurt you for that food in your hand. In the basics, ideally on the field, I teach the horse, “Head up,” while using my energy and hand motion to draw the horses head up off the grass, make him wait a minute or two (then walk with me or perhaps back up with me). When I point down to the grass (directing my energy downward) as I say, “Head down, good boy.” then he knows that voice command. When I feed the daily grain, I set the food in front of the horse and then I say, “eyes” while looking expectantly into the horses eyes. If the horse drops his head to eat the grain without looking at my eyes with his ears forward, then I rather strongly tell him, “head up.” I like to wait just another 5 seconds with the horse looking into my eyes, his head up and proud, ears forward before I say, “head down.” or “Okay,” pointing down at his food to allow him to eat it. I don’t like to interrupt him at all while he is eating since he was a good boy and already asked permission correctly. The training has to be consistent and kind. Please note: I do not use any permission checks for hay, just for grain or pellets. This technique of permission checking may not seem nice from a human perspective, but a horse will give you attention and respect in a different way if you start to have a few rules around food. 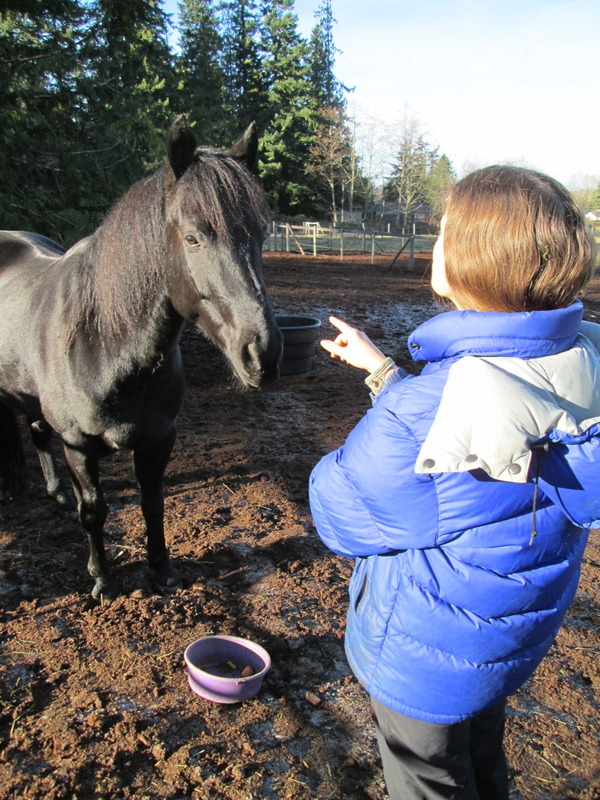 It is actually kinder from the horse’s standpoint that you are looking out for him, telling him when there is no predator, telling him when to eat his grain.